I have spent many summers guiding at Kesagami Wilderness Lodge. Kesagami is a fly-in lodge about 90 miles north of Cochrane, Ontario. One of my favourite aspects of guiding here is creating a delicious shore lunch. I take a great deal of pride in preparing a shore lunch experience that people will remember. In fact, I make sure my clients will never get the same meal twice while they are on my boat. This means I must fly in a few of my own spices, vegetables, breads, soups etc. to make sure I appeal to clients taste buds and I keep their bellies full. A standard shore lunch consists of fried fish (covered in Rocky Madsen’s Fish Crisp), fried potatoes and beans. It is delicious and some people can’t get enough but I find after a couple of days of fried food my stomach is asking for a break. This is when I break out my Honey Peppered Walleye recipe. Now I am not going to give you a recipe with “a cup of this”, a “teaspoon of this” and a “dash of that”. 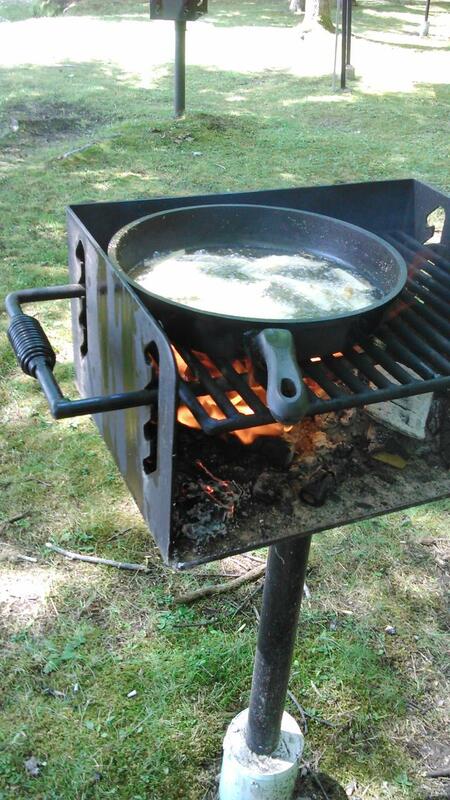 We are outdoors cooking over an open flame…measuring tools aren’t important. What you need…tinfoil, olive oil, walleye filets (two 16 inch walleye will work great), garlic salt, paprika, basil, liquid honey, diced ½ green pepper, ½ yellow pepper, ½ red pepper and 1 whole jalapeno pepper. On a two foot long sheet of tinfoil pour some olive oil and spread it around the centre (where you will lay the filets). Lay the filets side by side. I prefer to lay the thicker pieces (back) on the bottom layer and the thinner pieces (tail and stomach) on the upper layer. Sprinkle garlic salt, paprika and basil on the bottom layer of filets. Next, lay the tail and stomach filets on top of the pepper layer and repeat the spices, honey and remaining diced peppers on the top layer. Place a second oiled piece of tin foil on the top and wrap it all tightly together. Then add another layer of tin foil (without the oil) and even a third layer to make sure everything stays together. Place the wrapped fish on your grate and let it cook with the bottom side down over a hot flame for about 10 minutes. Then flip the fish over (I use two large spatulas for “the Flip”) and cook for another 8 minutes. The cooking is done by trial and error as you learn how hot your flame is, how thick your filets are etc. When you open the foil, the fish should be white and fall apart quite easily. Serve the walleye covered with peppers. Add some boiled corn, green beans, or carrots and a multigrain bun and there you have it….a delicious and very healthy shore lunch.